This translation has been two years in the planning. It has taken about nine months of persistent hard work to finally bring this project to fruition. For a start I would like to thank Posaune and her friends for helping with this monumental translation. The newer system will be presented to the reader differently and should be read as complementary to the 1960s system presented here. To measure quickly and efficiently, you should create a measurement chart. 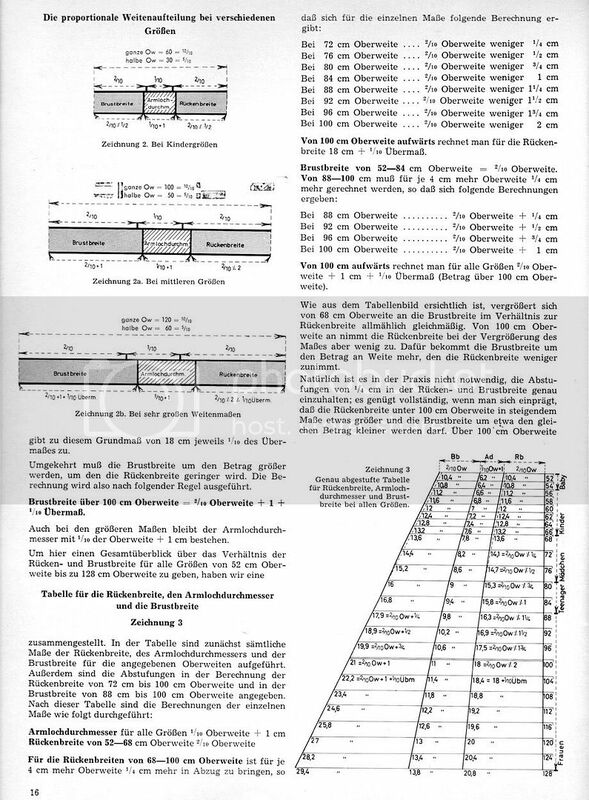 Because some measurements are similar, it is advisable to always notate measurements in the same order as the chart and the illustrations. This will help avoid confusion. All measures should be taken with the tape flat without holding it too loosely or too tense. 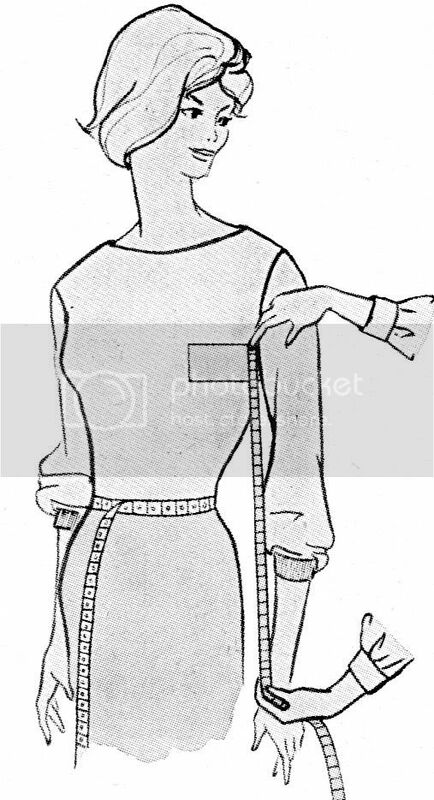 Measurements should always be accompanied by careful observation of the figure. Watch for things such as posture, corpulence, seat, and curvature of the spine, which can affect fit. 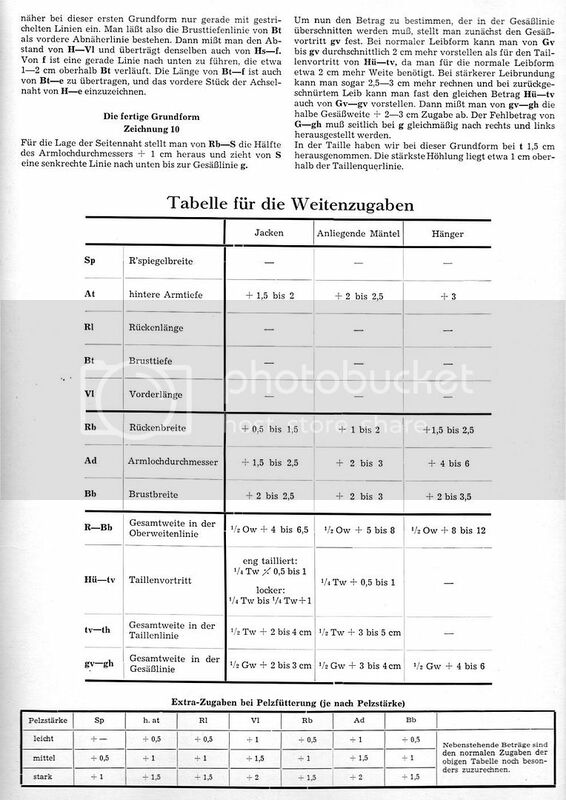 Note all this on the measurement chart as additional information. Ease will only be added later on. The amounts of added ease to the measures must always be in keeping with fashion, taste, the dictates of the figure, the style of garment, and the weight of cloth. However, this is something that need only concern us while drafting the pattern later once all measurements are taken and verified. 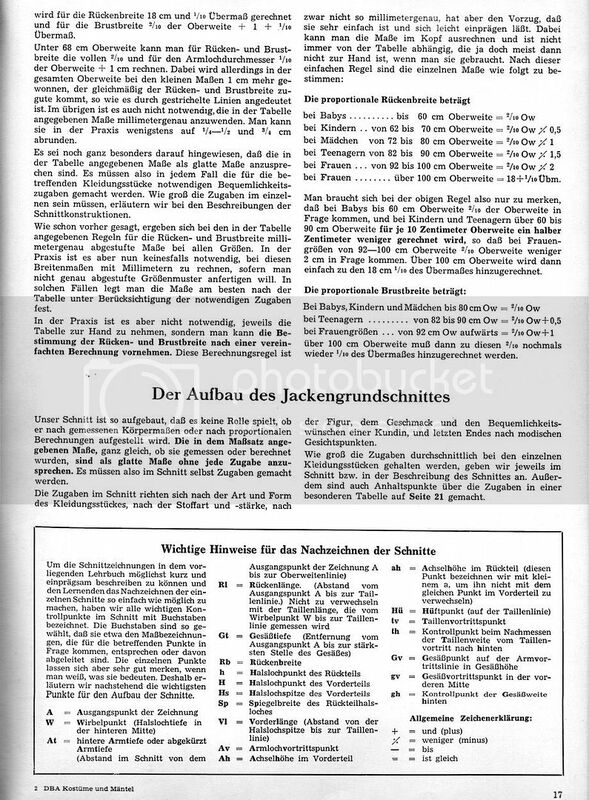 Bt = Depth of bust, sometimes called the "front shoulder measure"
The German abbreviations are used because Rundschau drafts will be marked with these. 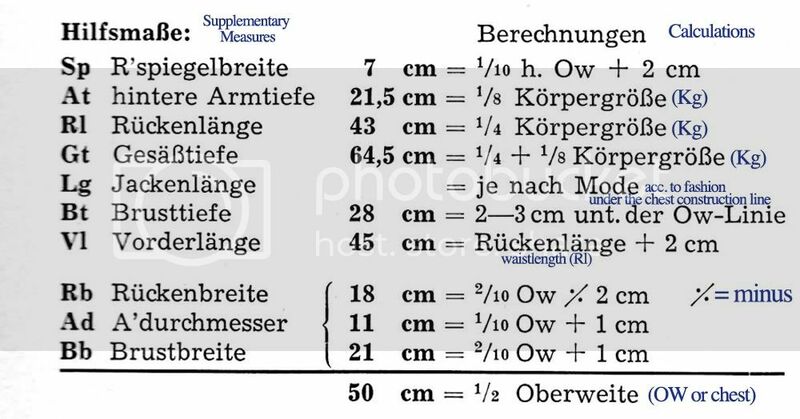 You also see a measurement table with these abbreviations at the top of every Rundschau pattern, and once familiar with them you will be able to follow the table even if you don't read German. 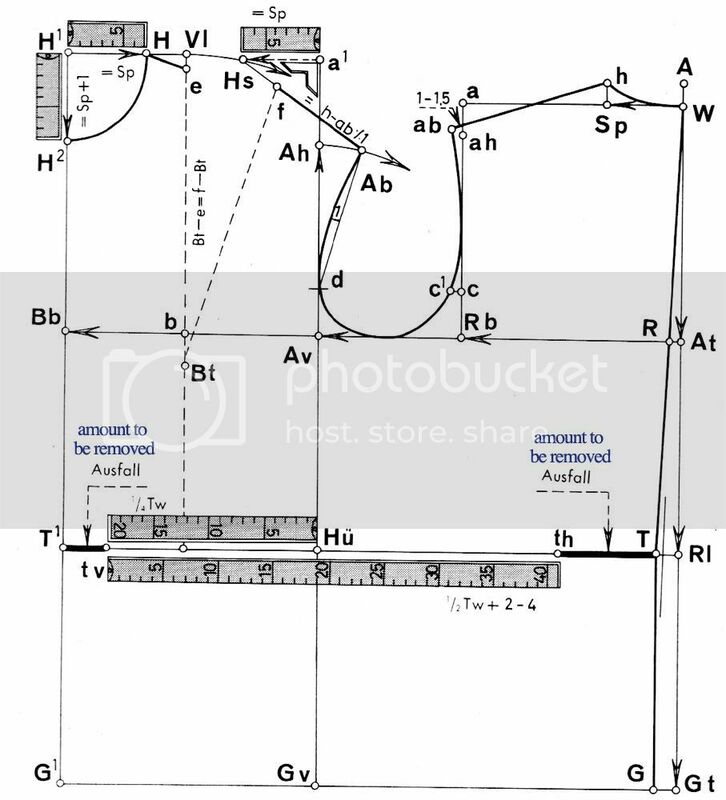 Measurements are classified as either principle or supplementary measures. There are four primary measurements: Height (Kg), Bust (OW), Waist (TW), and Hip (GW). The direct measures taken off the figure are always recorded for them. 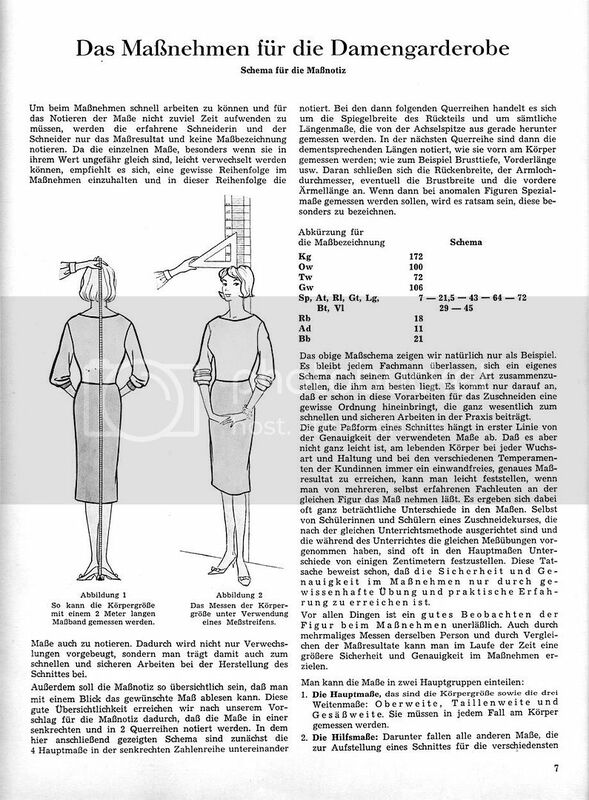 The body height measurement is used to obtain aesthetically pleasing proportional divisions of a garment. Measure from the top of the head straight down to the floor. This can be done with a tape measure (2 m long) which has a weight attached at the tip to keep the tape measure in a plumb line to the floor. If the client has an up-swept hairstyle, press down. 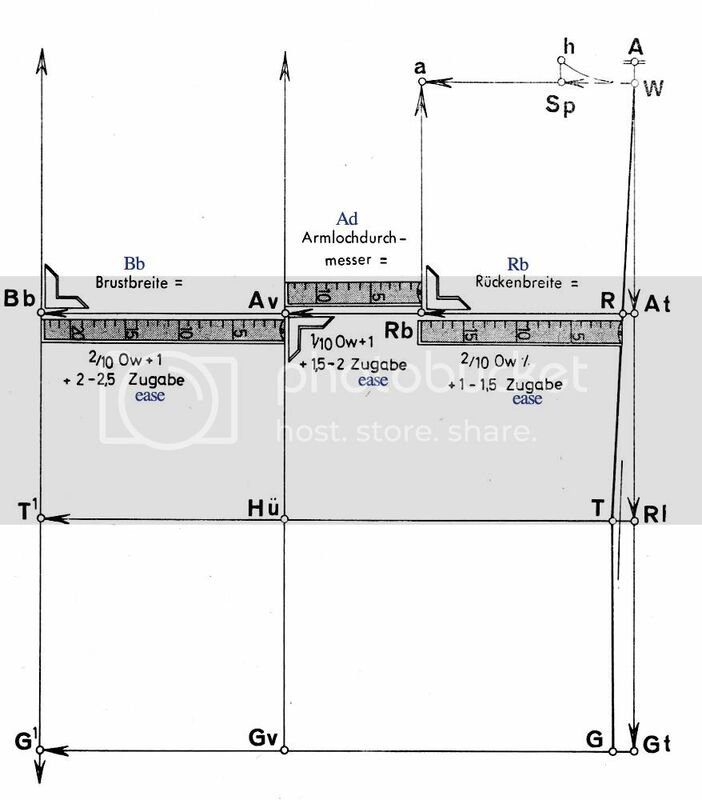 Another way is to fasten a tape measure on the wall in a plumb line and take the height measurement as shown in the picture shown here. 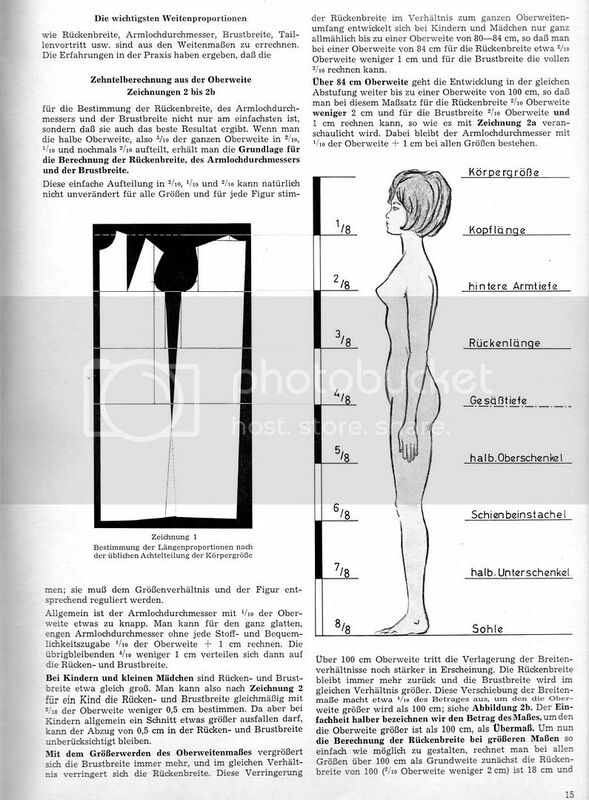 If the client decides to be measured in high heels then the proportions are calculated using this height measurement. 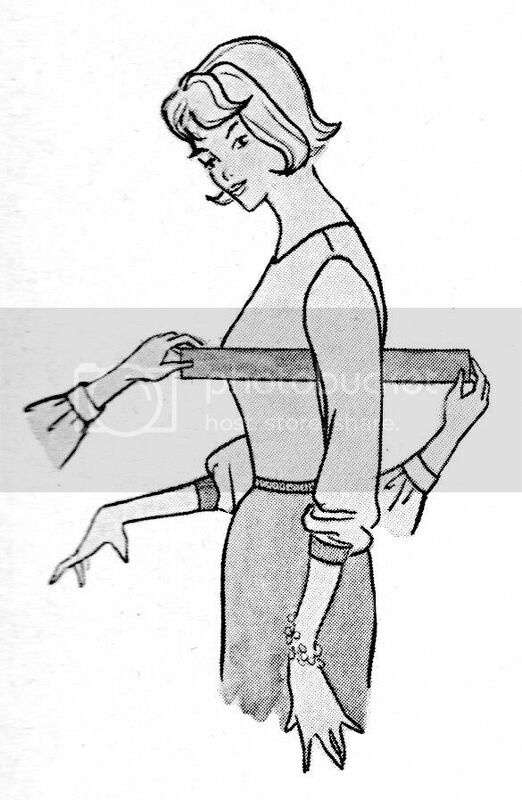 When taking this measurement, it is advisable to hold the tape measure in one hand so that the free hanging part of the tape is a bit longer than the bust measurement. This measurement is taken from the back. Put your arms around the client, lay the tape measure at the fullest part of the bust, bring it around under the arms smoothly touching the armpit and then to the centre back, horizontally from armpit to armpit. Then read the measurement as shown. Measuring from the front might cause the tape to slip down in the back. You can measure the half body if the client is wearing only undergarments and you have established the centre front and the centre back. However, measuring the half body can result in a bigger measurement, which can be compensated by the addition of less ease. 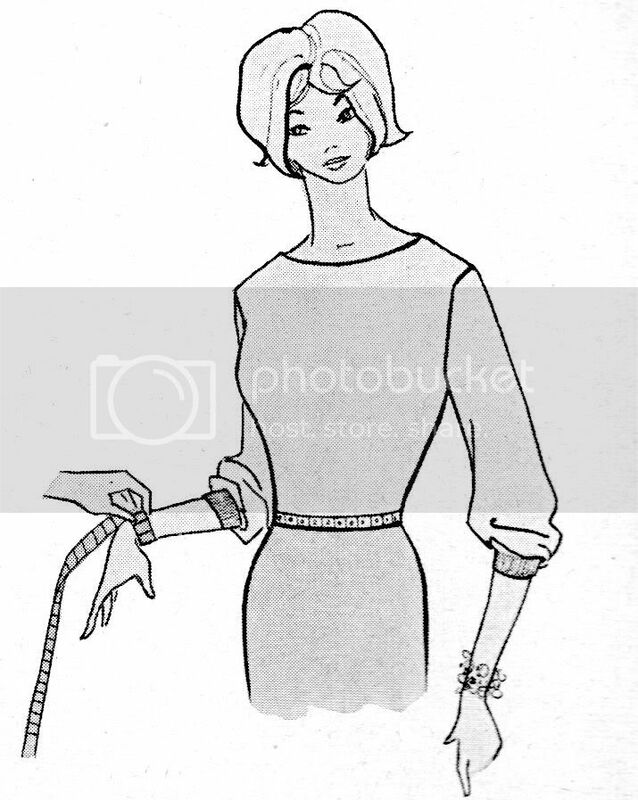 To measure the waist hold the tape measure as described above (See The Bust Measurement). You bring the end of the tape to the measured circumference a little to the side of the centre front. The waist should be the smallest circumference at the waist area. 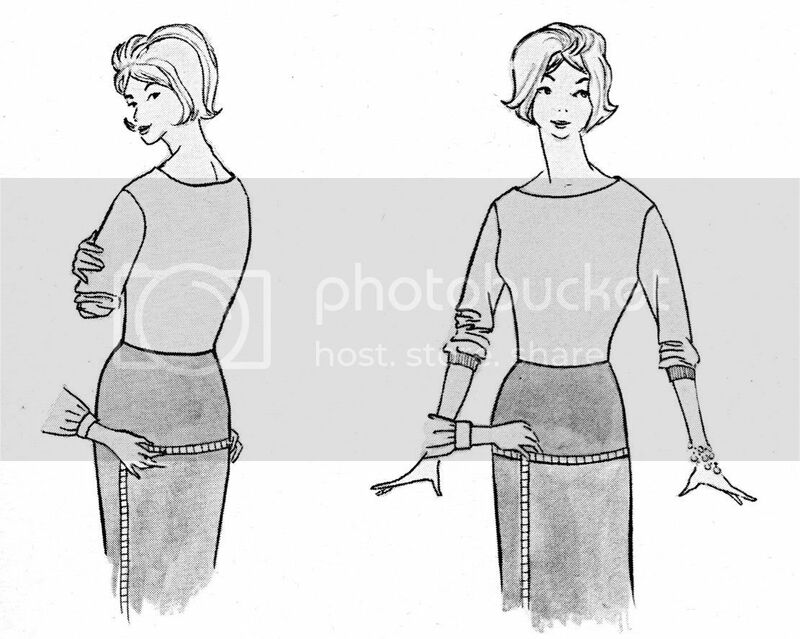 If client is wearing clothing, then pin it in at the waist to get a more accurate measurement. To avoid offending the client, measure it at the front slightly away from the centre, but viewing the body from the side to determine the widest part of the seat. 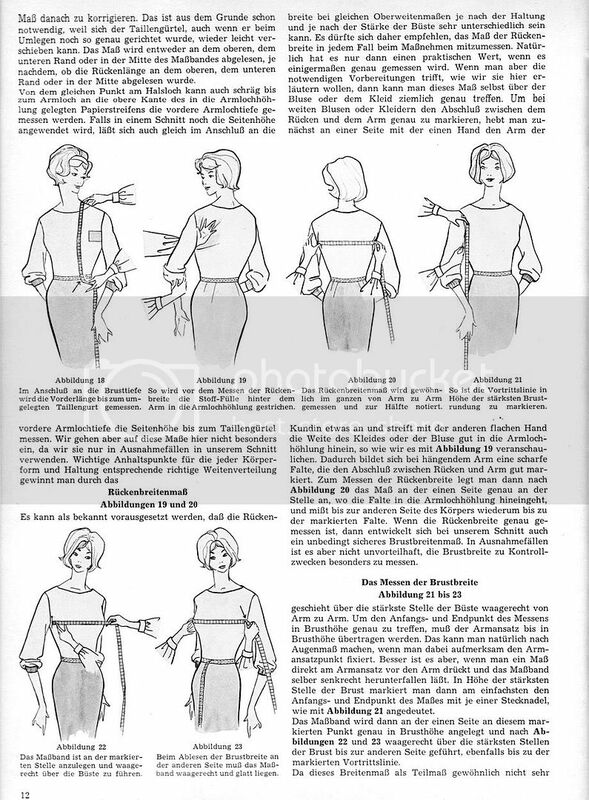 Follow the same procedure as you did in taking the waist measurement. Take the depth of this measurement later since the location of the widest part can differ greatly. 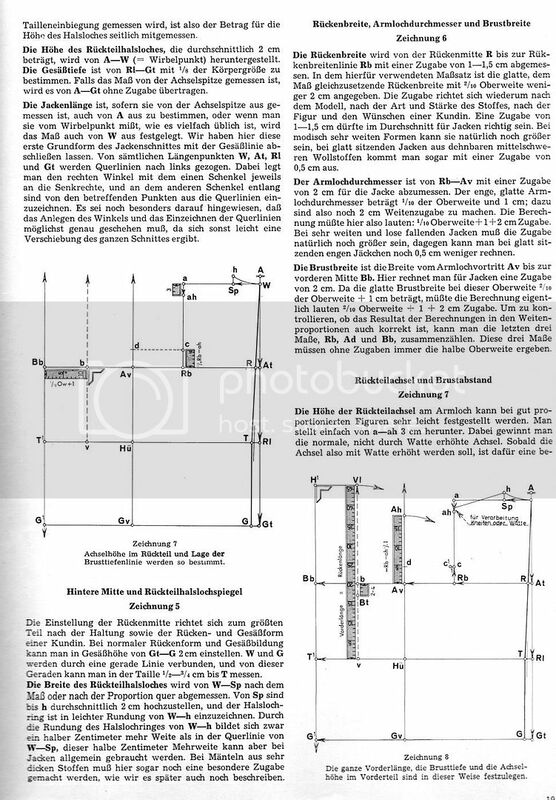 In the Rundschau system, either the direct or calculated measure can be used. Because of the wide variability observed, even amongst women with the same chest measure, it is recommended that direct supplementary measures be taken, as they are critical to achieving good fit. While it is not strictly necessary to always to take every single one of the direct supplementary measures, it is still advisable to have them at hand for use as check measures. It is advisable to take the direct measurement and then to compare them with the calculated measurement. 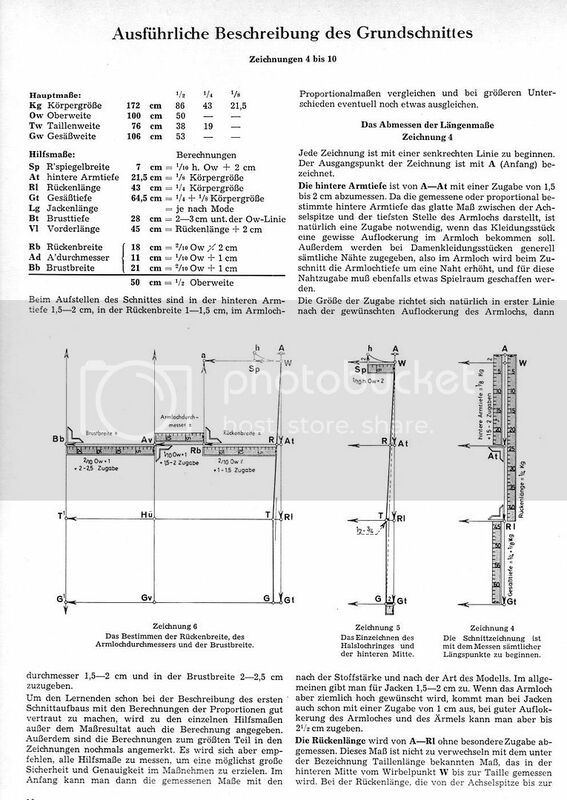 The secondary measurements (beginning at row 5 in the chart above) are the back neck (Sp) followed by the other length measurements originating from the neck point. 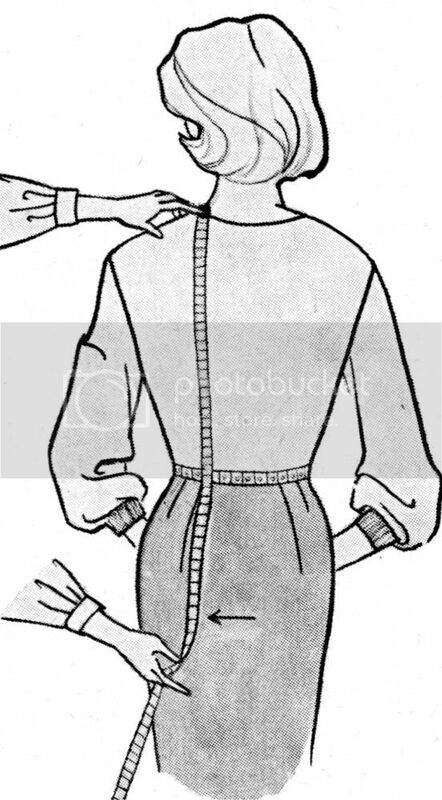 These include the arm scye depth (At), the waist length (Rl), hip depth (Gt), and the desired length (L) of the garment. 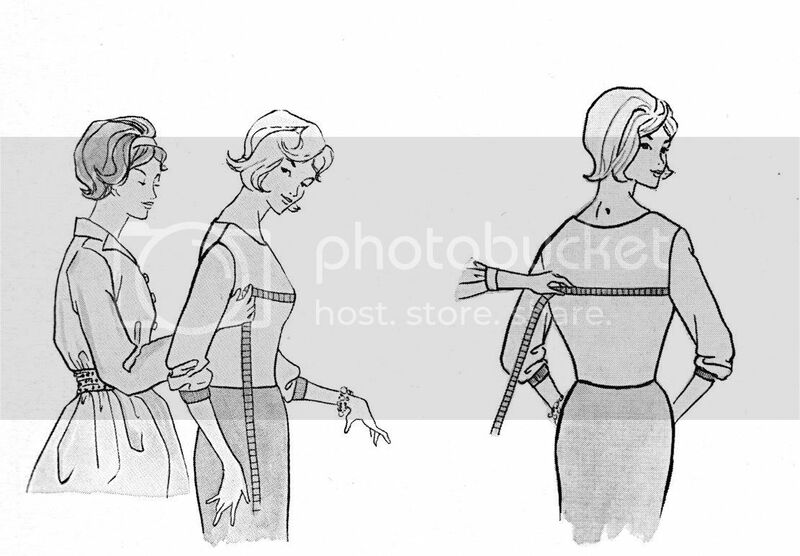 Row 6 contains the front length measurements originating from the neck point: Depth of Bust (Bt) and Front Waist Length (Vl). Rows 7,8, and 9 are the Back Width (Rb), the Armscye Width (Ad) and the Bust Width (Bb). They can be taken from the seventh cervical vertebra (C7 or 'tailor's bone') at the back, or as will be shown here, from the neck point. The neck point is preferred because it is easy to establish this point on the body. Sometimes, when the back neck (Sp) is calculated with the help of the bust measurement, it can introduce errors, and so a direct measure is taken. 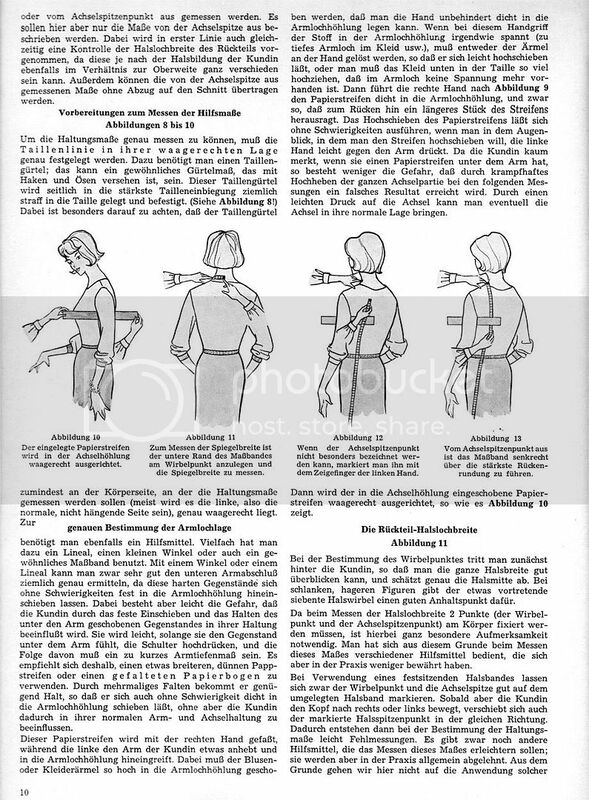 To analyse the posture, first establish the waist with a horizontal waistband. Normally the left side is measured since the right side frequently sits lower. Adjust if necessary. The arm must be in its natural position. Make certain that the shoulder is in its natural position. If not, push it a little down until it is. Start measuring from C7 towards the neck point. Stand behind the client so that you can see the width of back neck clearly. Seek the exact centre of back. The 7th vertebrae is a good starting point because it is easy to spot since it is more pronounced. Measure from there to the neck point. Take the measurement at the bottom of the tape measure. Compare the result with the calculated measurement (1/10th chest + 2cm). If there is a marked difference between the direct and calculated measurement, retake the measure ensuring the body landmarks have been correctly identified. Use the calculated measurement to ensure the correct balance of the pattern. The the pattern can be corrected for the larger directly measured back neck after the pattern draft is completed. 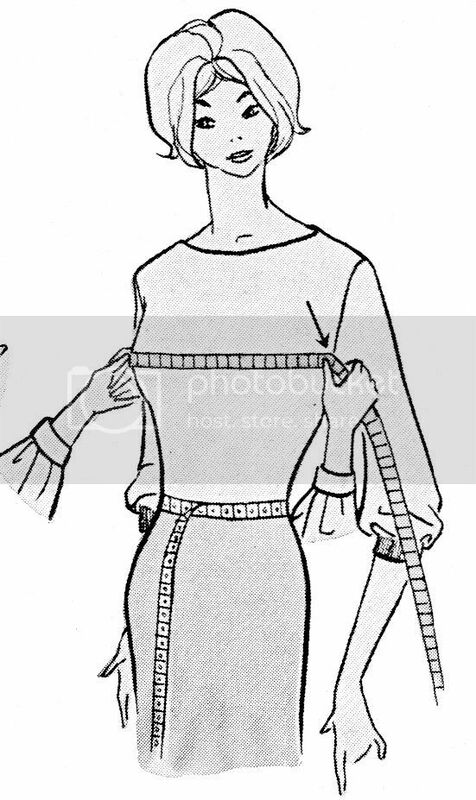 The last measurement to be taken is the final length of the garment. You can take additional measurements from the neck point sloping down to the upper edge of the paper strip to measure the depth of the armscye in front and also the length from there to the waist band to determine the length of the side seam from the underarm point to the waist. Even for the same bust circumference measurement, the back width can vary significantly from figure to figure. As a result, great care should be taken when taking this measurement. It can even be done over a blouse. This measurement is taken from the crease created by the arm joining the body on one side to the other. Done correctly the pattern will have the correct width of back. When you measure across the bust this way, there might be more ease than needed, but this can be adjusted later. If you take the circumference at the middle of neck, then you must add 2-3 cm for the calculated base of neck measure. For a disproportionate figure, both direct measurements should be taken. This measurement can be taken with the paper band still under the arm, after taking the preliminary measures. This measurement is taken from the top of the paper band under the arm to the wrist. 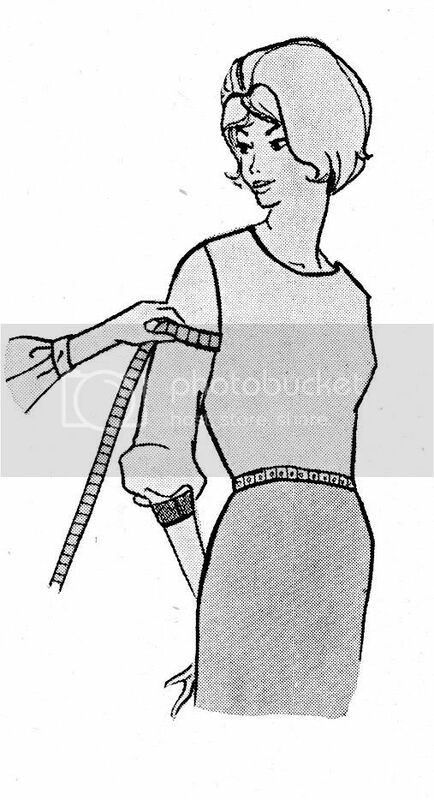 You can also take the measurement from the underarm to the elbow. To create a short sleeve you can shorten the sleeve length later. The length to elbow can also be recorded. 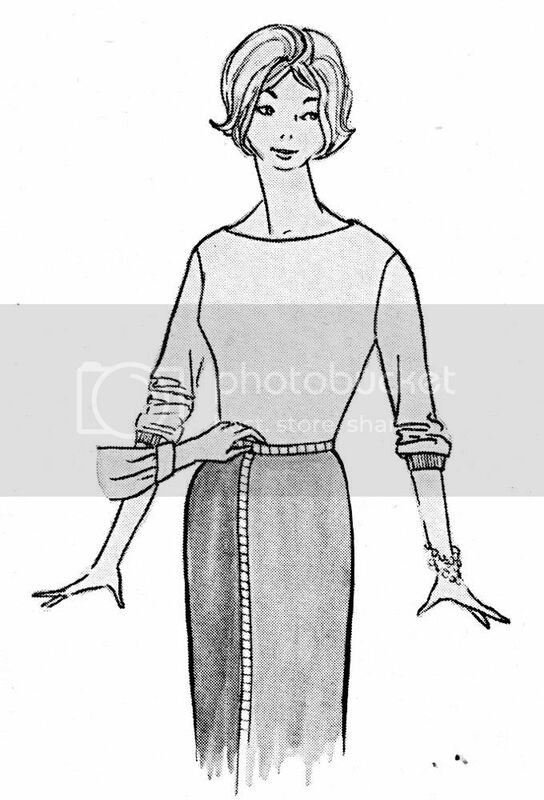 More important is the top sleeve length from the neck point, over the shoulder seam down to the base of the wrist. In many cases direct measures cannot be used directly without some sort adjustment being made, when the measure does not stand in good proportion to the other measures. 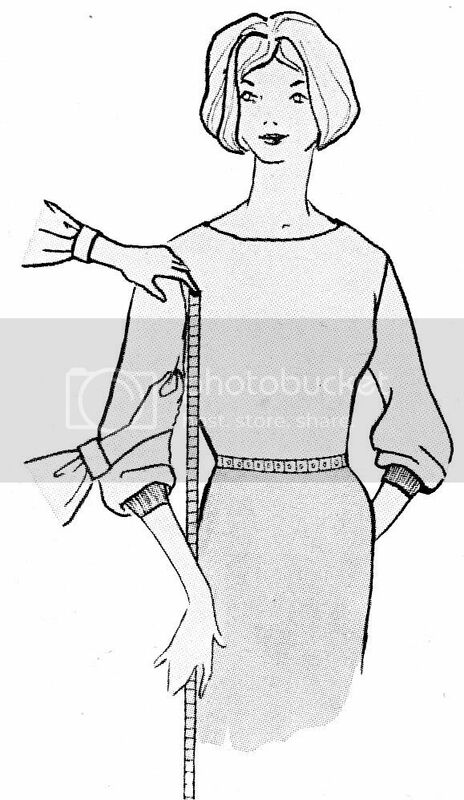 The waist length may for instance be too short or long relative to the height. At this point the cutter should compare the real body measurements with the ones that can be calculated to achieve the most pleasing proportions to the eye, and be prepared to make some adjustments. However, to do this some sort of concept of proportion and the relationship of a single measure to all the others is essential. The recognition that a proportionate relationship exists between single direct measures is essential to creating garment of stylish and tasteful proportions. If a figure has a measurement that is disproportionate, it is easier for the cutter to adjust for this by choosing a cut that de-emphasise this, for example by clever seam placement. This means that all direct measurements must be carefully compared to the calculated proportionate measure. The body measurements and the calculated measurements will not always match. This is especially true of a very small or very large figures or a very short or very tall figures. In these cases the proportionate scye depth will not be correct. In such cases, you use the measured value instead of the calculated one or you determine a value based on with both numbers, keeping in mind the relative height and bust measurements. 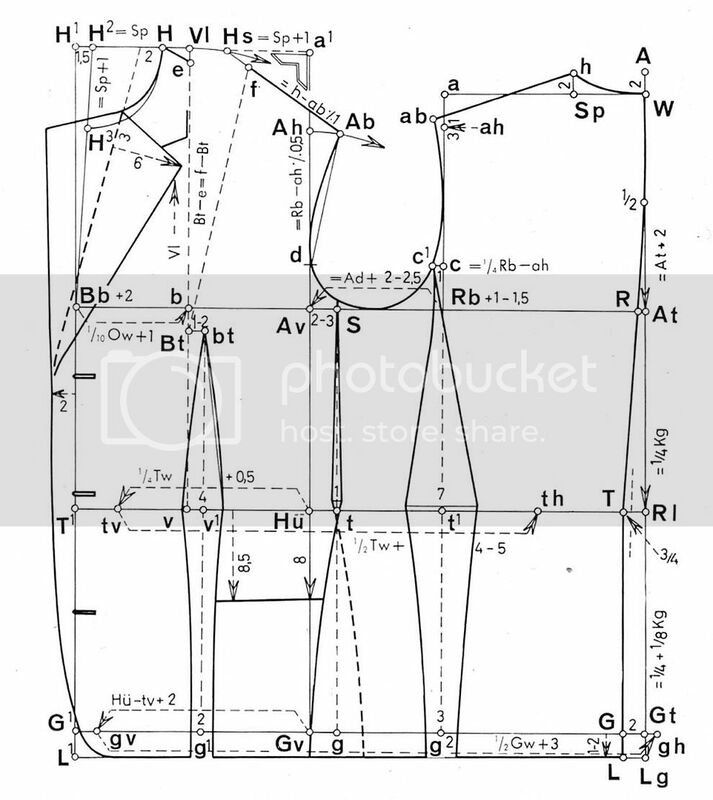 To draft well proportioned drafts, calculated measurements are derived from the proportional divisions of the body. For example, the height of the client should be divided in halves, fourths and eighths. Write these down before you start. 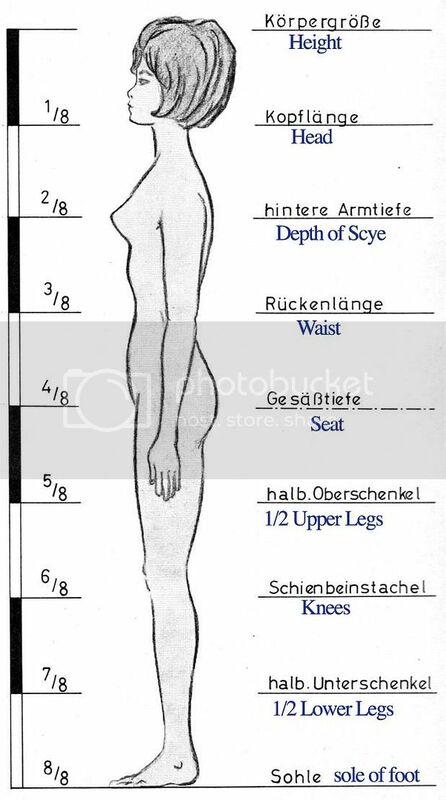 You should also note the proportionate measurements for waist length, scye depth and hip depth. The body is divided into eight sections, as is the practice amongst sculptors. The first eighth: the head from the top of the head to the neck point. The second eighth: is measured from the neckpoint to the depth of scye. The fourth eight: is the length down to the seat. 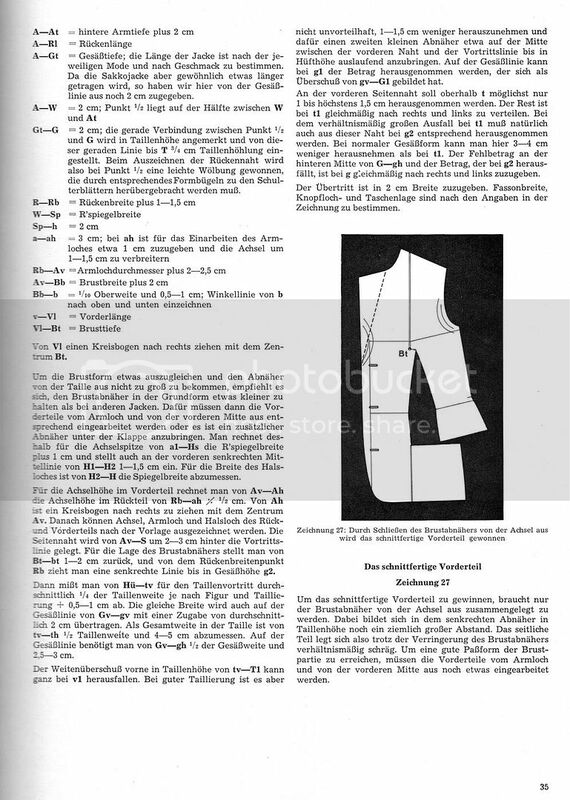 "je nach Mode" means "according to fashion"
For a draft an ease of 1.5-2 cm has been given to the depth of scye, 1.5-2.5cm to the width of back, 1.5-2cm to the armscye circumference and 2-2.5cm in the width of chest. In order to familiarise the learner with the description of the initial pattern draft, the calculation of the supplementary measures has been shown in addition to that of the principle measures. 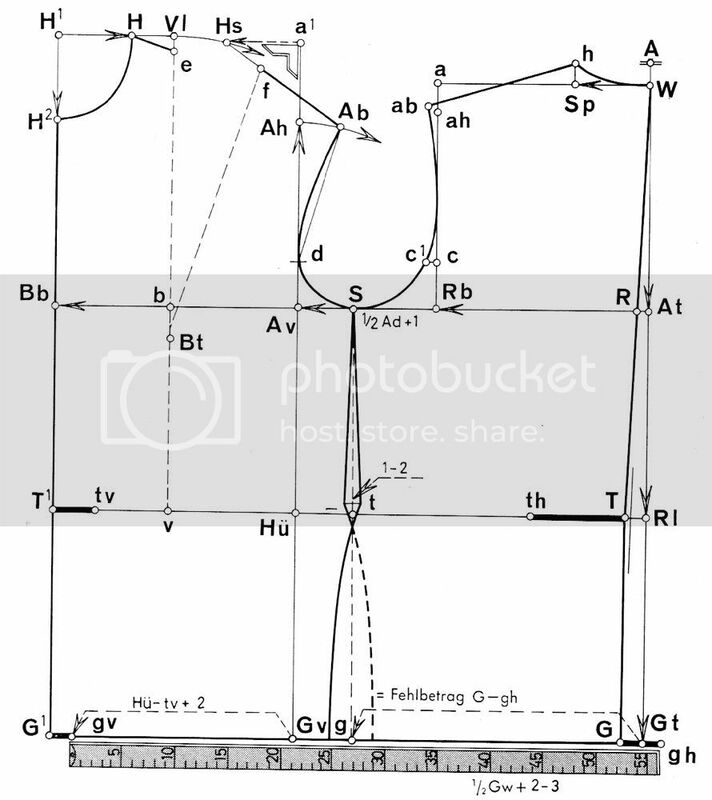 Additionally, the calculations are further shown in the diagram. It is definitely recommended that direct supplementary measures also be taken in order to attain maximal certainly and precision in the measurements. In the beginning, the direct measures can be compared with calculated measures. Where the difference is substantial, the average of the two can be used. Every draft commences with a vertical line. The commencement point of the draft is shown at A. The depth of scye at back from A-At with the addition of 1.5-2cm ease. Some degree of loosening up is required by the addition of ease as the depth of scye represents the straight measure between the neck point and the deepest part of the armscye. 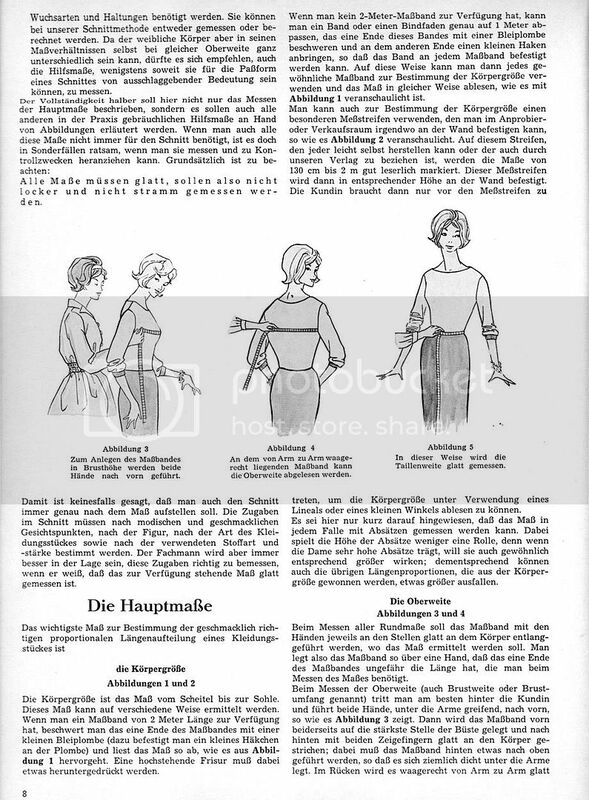 Additionally, in ladies' cutting seams drafted nett. Thus the armscye tends to be made shallower by a seam and room must be allowed for this. The size of the allowance depends in the first place on the desired amount in the armscye, but also on the weight of the cloth the style of the cut. For jackets an allowance of 1.5-2cm is provided for. If it is desired that the armscye be high, the allowance can be reduced to 1 cm but for an easier armscye and sleeve it can be increased to 2.5 cm. The Length of Waist (Rl) is added to the draft from A-Rl without the addition of ease. 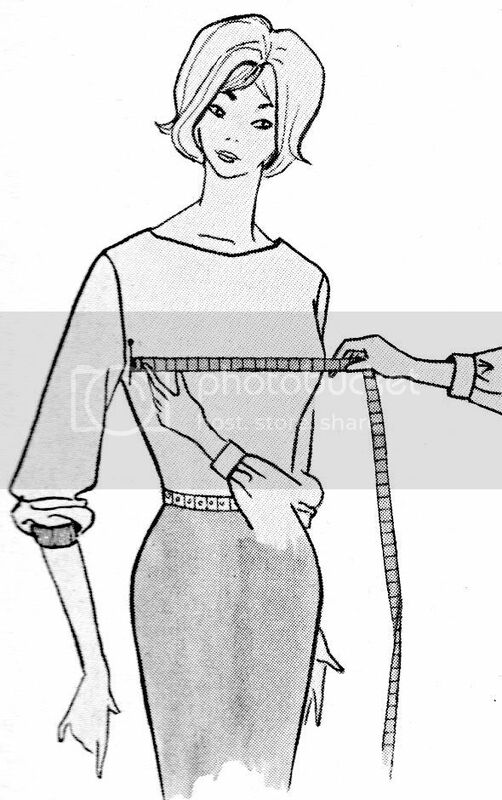 The measure is not to be confused with the measure of waist length from W to the waistline. 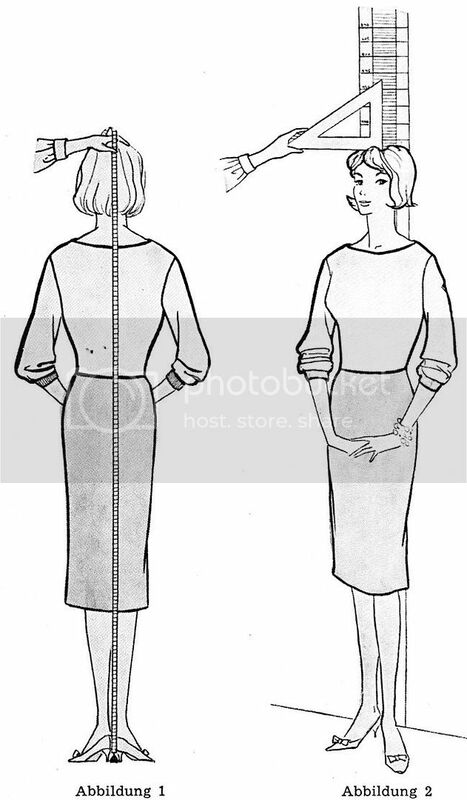 With the length of back, which is measured from the neckpoint to the waist construction line. The Height of the the Back Neck Seam is on average 2 cm. The height is from A-W (W=C7). The depth of seat is from Rl-Gt and constitutes 1/8 of the height. If the direct from the neckpoint has been taken, this is added at A-Gt without the addition of ease. The Jacket Length is also measured from point A; provided it has been measured from the neckpoint. 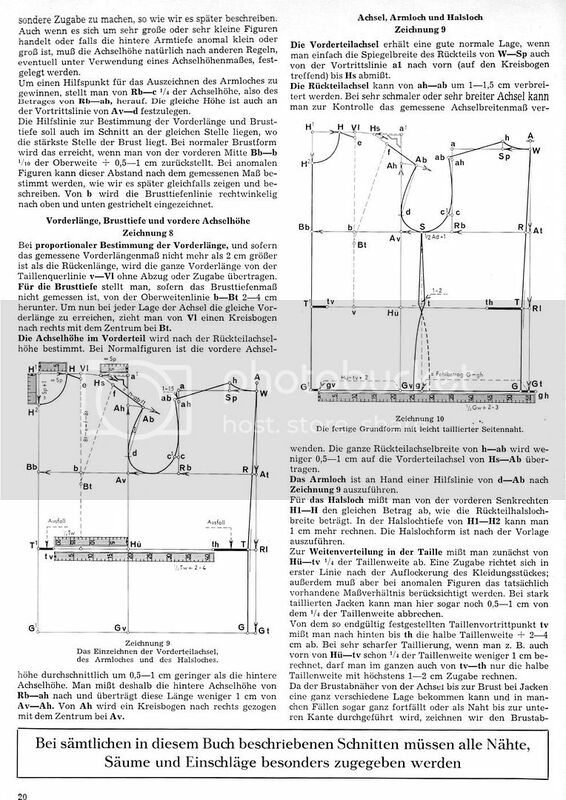 If the length has been measured from C7, as it often is, the length is measured from W. With this the establishment of the depth of seat line, the foundations of the coat have been established. Horizontal construction lines are squared out from all of the points W, At, Rl, and Gt. The square is placed so that lines precisely squared out from these points, otherwise there will be a distortion of the entire draft. The drafting of the centre back depends on the most part on the posture of the client, as well as her shape of back and seat. When the shape of back and seat are normal Gt-G is 2cm. W is joined to G with a straight line. Along this line come in 1/2-3/4 cm along the waist construction line to find point T.
The Width fo the Back Neck form W-Sp can be decided either by direct or proportionate measures. From Sp to h move up 2 cm and a curve is drawn from W-h. By adding this curvature, the line from W-h should gain a half centimetre over the straight length from W-Sp. This additional half centimetre is something added to all coats, however with overcoats made of heavy cloth, extra ease must be added here, as we will describe in later sections. The width of back is drafted from the centre back, R to the width-of-back line, Rb, with the addition of 1-1.5cm ease. The measure used here is calculated by taking 2/10 of the chest measure minus 2cm. The amount of ease depends on the style, the character and weight the cloth, the figure and the preferences of the client. An ease of 1-1.5cm is correct for a jacket. For fashions with an easier fit, the ease can be increased. For close fitting jackets made of stretchable wools of medium weight, the amount of ease can even be reduced down to 0.5cm. The armscye width is added from Rb-Av with an additional ease of 2cm for jackets. The cleanly fitted armscye width is measured at 1/10th of chest measure plus 1cm. In addition, another 2cm of ease is added. With particularly easy fitting jackets, the amount of ease has be increased and for close fitting styles of jacket, the ease can be reduced to 0.5cm. The Width of Chest is the width from the front of scye line, Av, to the centre front Bb. The amount of ease can be reckoned at 2cm. 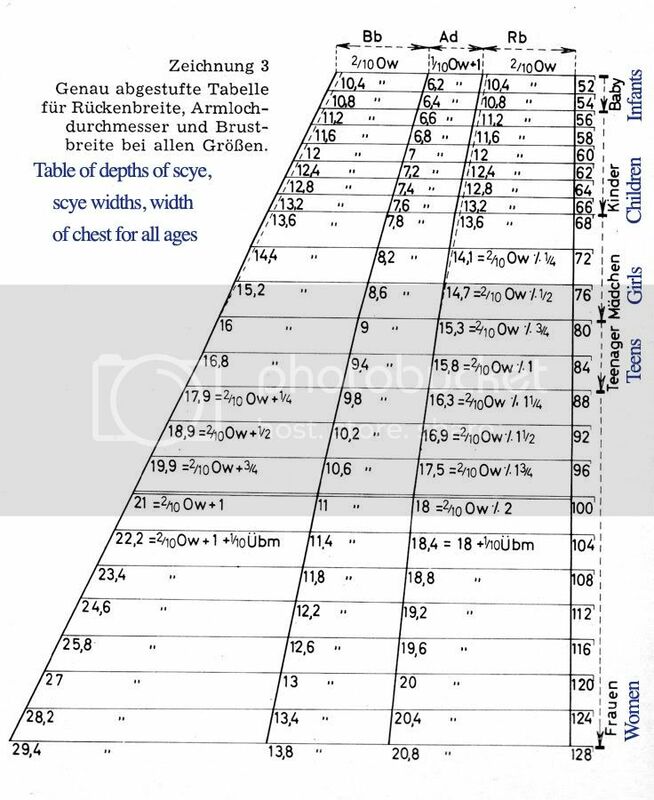 The plain width of chest is calculated by taking 2/10th of the chest measure + 1cm. The final calculated measure is calculated by 2/10th chest measure + 1 + 2cm ease. 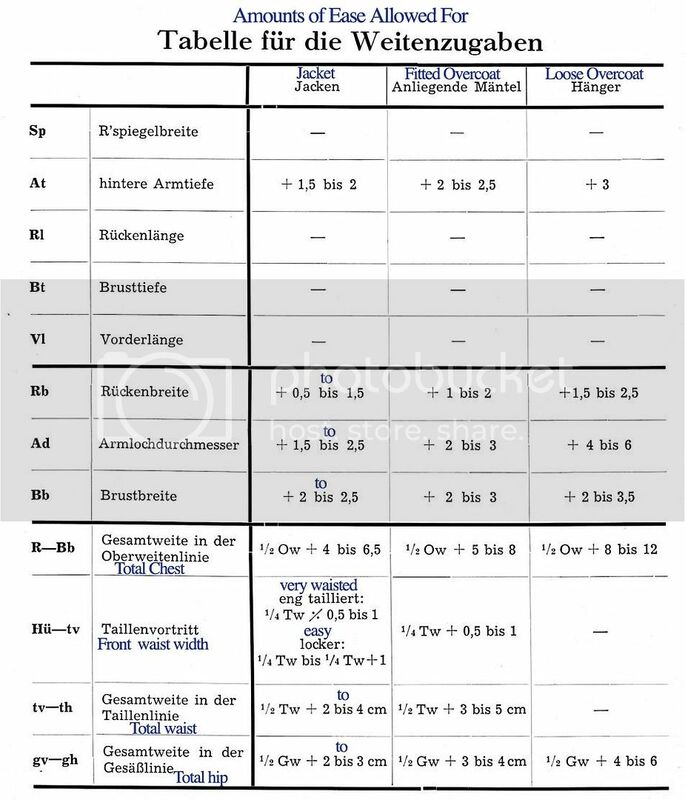 In order to check if the result is correct, the three lengths Rb, Ad, and Bb are added together. If the calculations are correct, this sum - minus the additional ease - must be equal to half the chest measure. 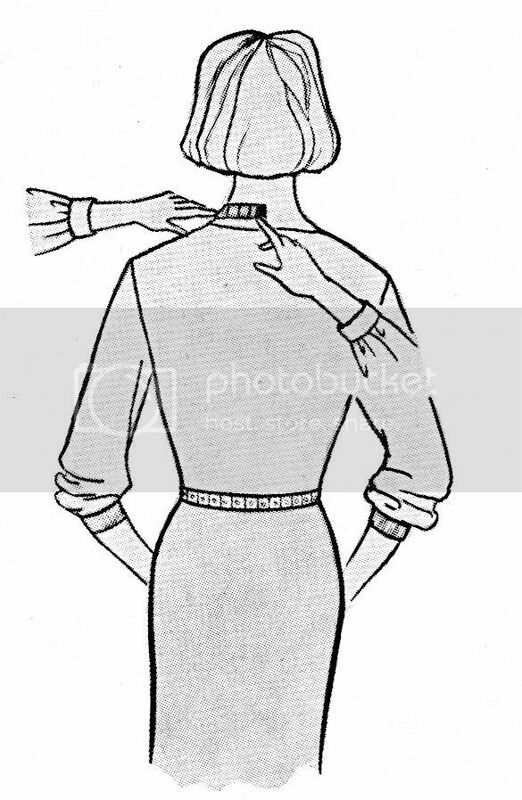 The height of the back shoulder seam at the armhole can be readily established on proportionate figures. 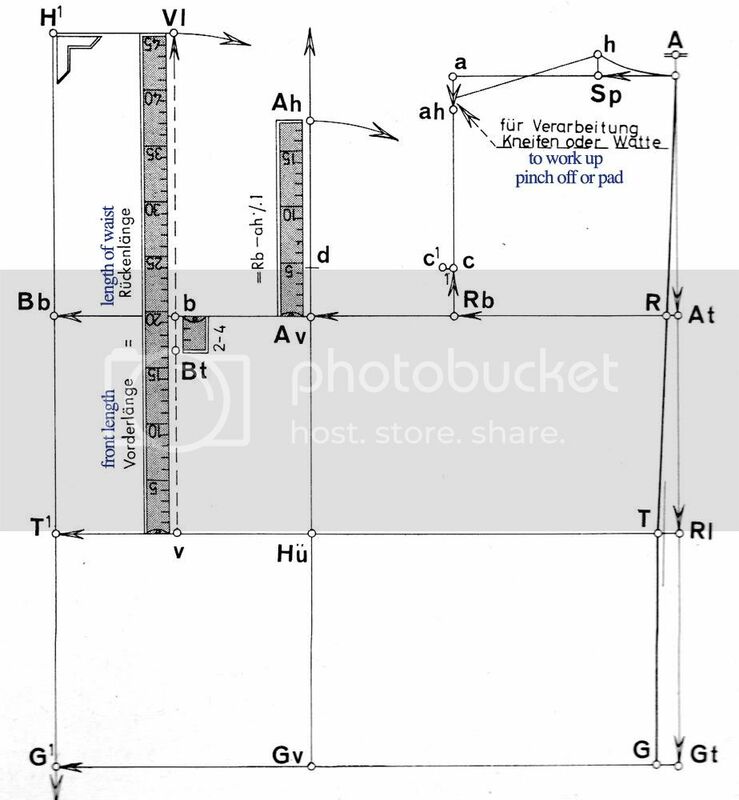 Point ah is found 3cm below point a. This determines the normal shoulder that is not elevated by a shoulder pad. 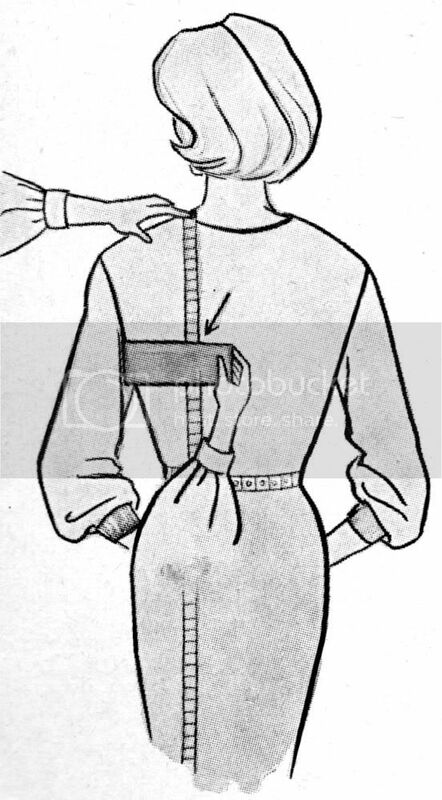 If the shoulder is elevated by padding, a modification must be made, which will be described later. 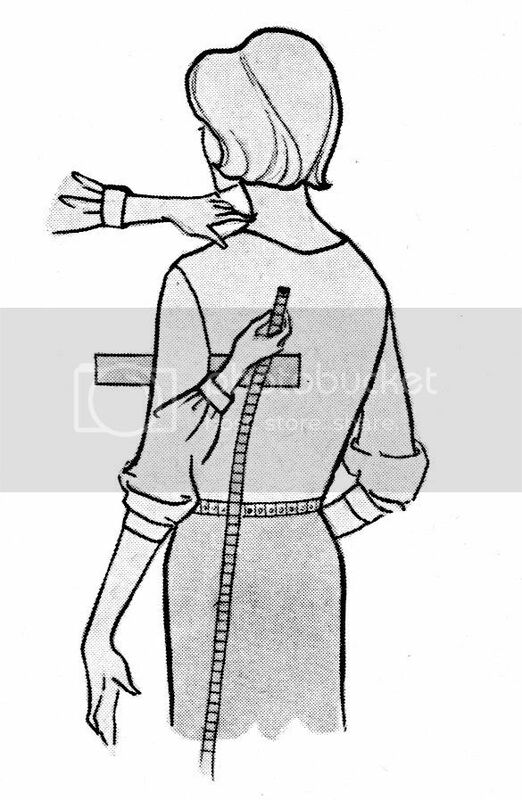 For unusually large or small figures, or those with a disproportionate back depth of scye, the height-of-shoulder-seam measure must be calculated by alternative methods, or else a device for measuring depth of scye used. 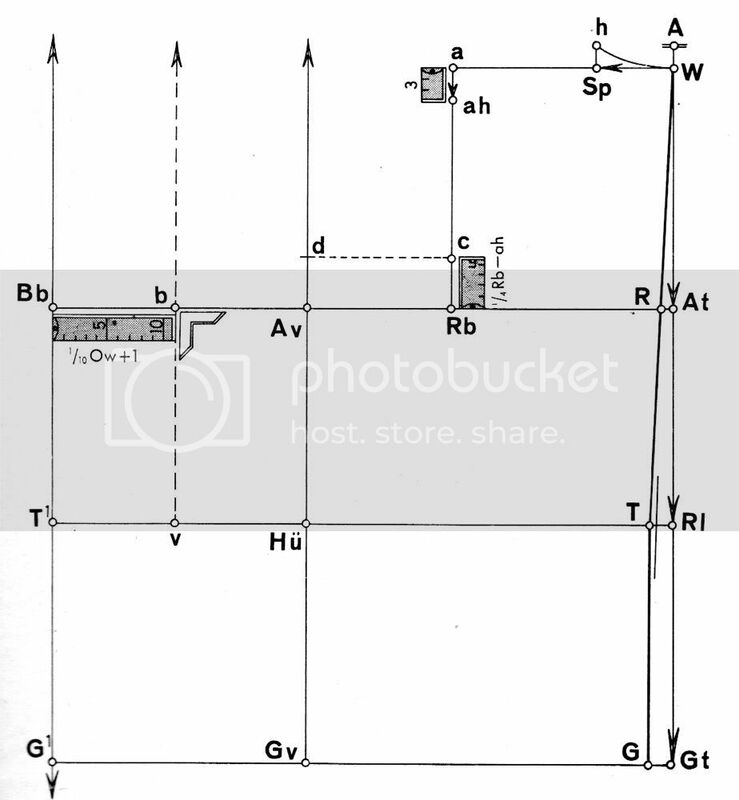 In order to find the construction point to aide in the drafting of the armscye, 1/4 of the depth of scye is placed at Rb-c (namely the distance of Rb-ah). The same amount is also placed along the front of scye line from Av-d. The construction line for the determination of the centre front line and depth of chest construction line should be placed on the draft at the same place where the greatest prominence of bust lies. This is achieved for normal chest shapes, when B-b is 1/10th of the chest measure + 0.5-1cm. From b square upwards and downwards drawing in a broken construction line. To determine the front length by means of proportionate calculations, where the measured front length is not greater than 2cm than the length of back, the entire length of v-V1 including the added ease is carried over. Where the front bust depth (front shoulder) measure has not been taken, the depth of bust placed 2-4cm below the chest construction line. 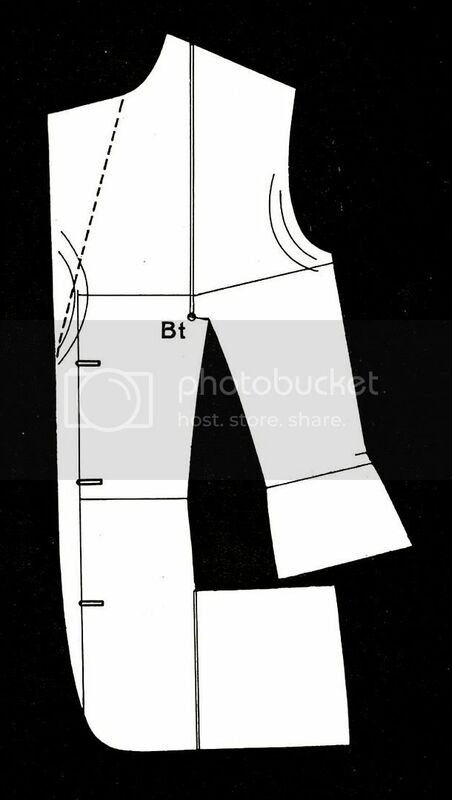 In order to ensure that the front length remains constant irrespective of the placement of the the shoulder seam, sweep from point V1 to the right pivoting around point B1 as the centre. 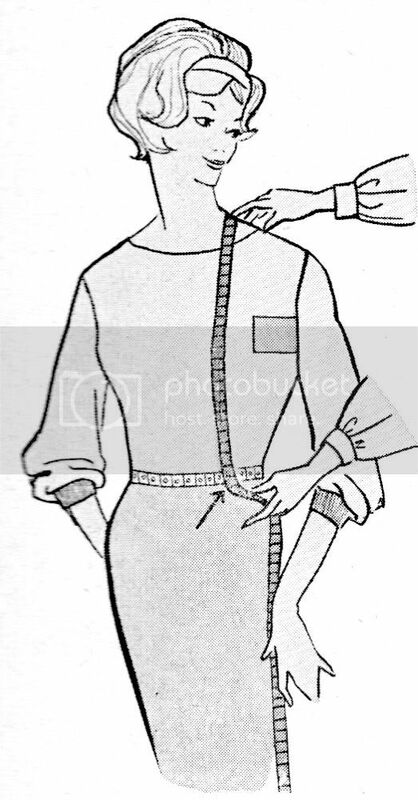 The Height of Front Shoulder Seam is determined by the position of the back shoulder seam. On normal figures the front shoulder seam height is on average around 0.5-1cm lower than the back shoulder seam height. 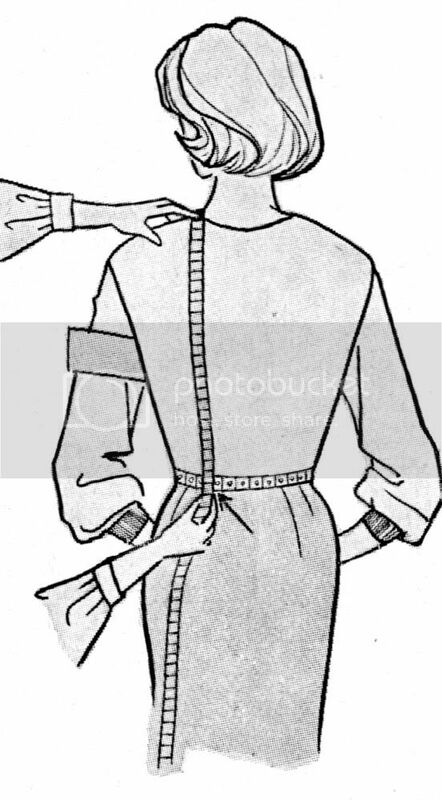 The back shoulder seam height is measured from Rb-ah and this is transferred over, less one cm, to Av-Ah. Sweep from Ah to the right, taking Av as the centre. The front should seam will be put in a good position just by taking the back neck from W-Sp and placing it at the front of scye line starting at a1 squaring out horizontally by the amount of the back neck point to point Hs. The back shoulder seam be lengthened around 1-1.5cm. For very narrow or wide shoulders the direct width of shoulder measure can be used as a check measure. 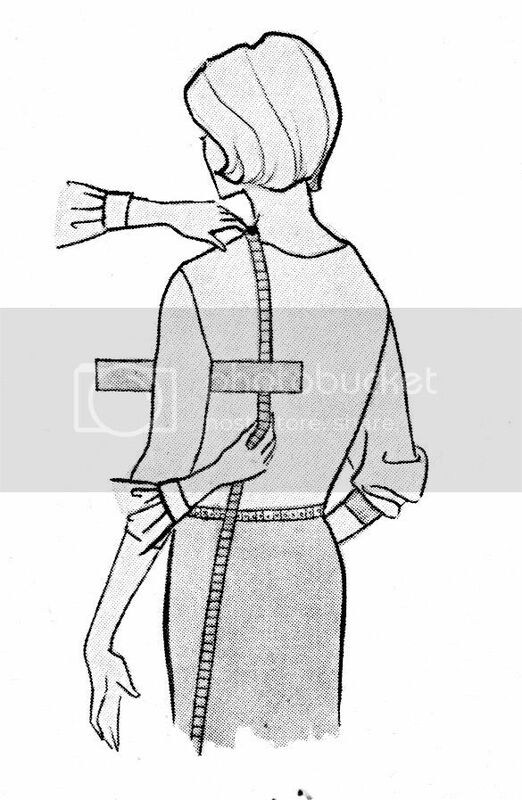 The complete back shoulder seam length from h-ab is transferred to the length of front shoulder, less 0.5-1cm. 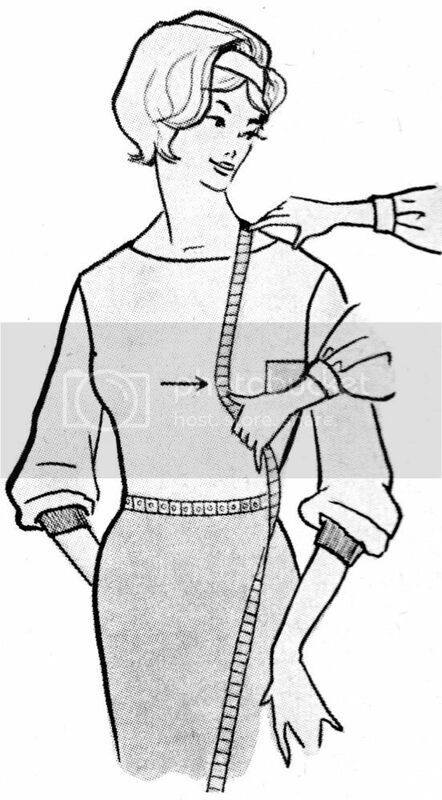 For the collar seam, place the measure of the width of the back neck at H-H1. The depth of the gorge seam seam H1-H2 is the back neck plus 1cm. Complete gorge seam as per diagram. 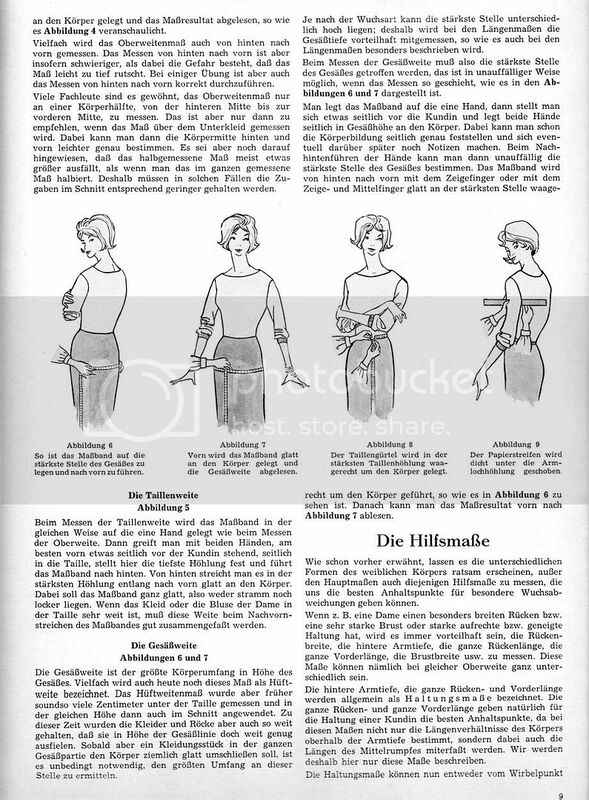 To find the divisions of the waist, measure first from Hü-tv, 1/4 of width of waist. The addition of ease to this measure will make the cut less fitted. Additionally, for disproportionate figures the direct measure recorded should be taken into account. For a strongly waist coat subtract 0.5-1cm from the value of 1/4 waist width. From the previously found waistline point tv measure backwards to point th, the distance of the width of waist + 2-4cm. Where the waist suppression is marked (eg you subtract 1cm from 1/4 of waist width placed at Hü-tv) you only need to place half the waist width from tv-th with the addition of, at most, 1-2cm. 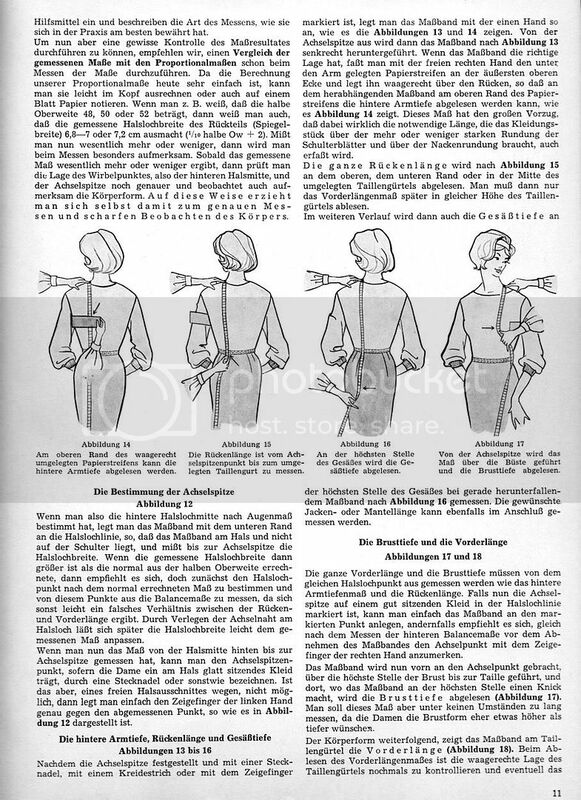 The bust dart from shoulder seam to bust can be displaced to different positions depending on the style of coat, or in some case be absent altogether. In other cases it may be displaces towards of the the coat. Because of the variability in the position of the bust dart, it is only provisionally drafted in with a broken line. A line extending Bt forms the first edge of bust dart. Next, measure the distance from H-V1 and carry this over to Hs-f. From f, extend a straight line down to a point 1-2 cm above Bt. The lenght of Bt-f is also carried over to Bt-e, and the front section of the shoulder seam from H-e is completed. From the position of the side seam, place from Rb-S the half of the armscye width + 1cm. Draw a vertical line downwards from extending to seat line g.
To determine how much the seat line has to be overcut, find the front of seat point gv. 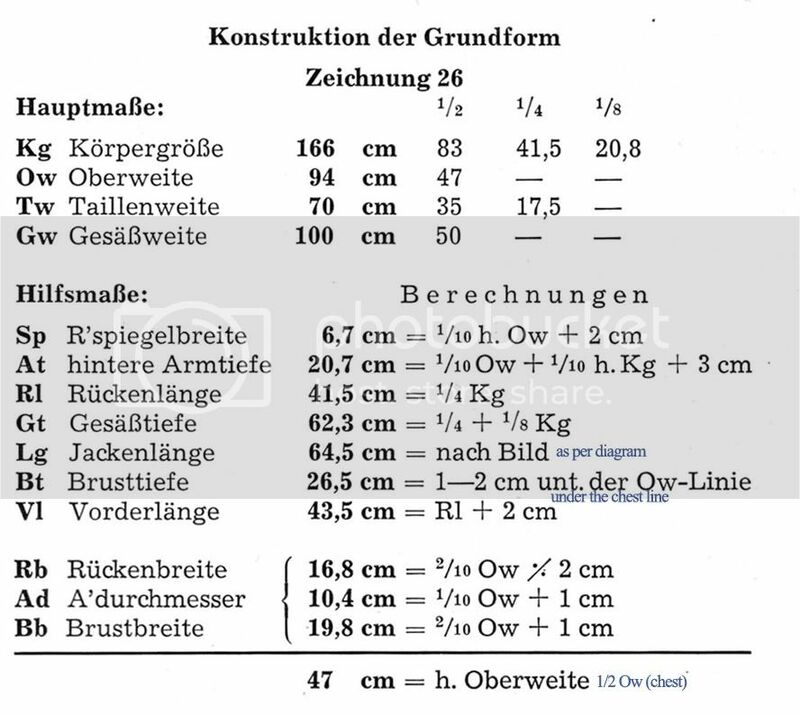 For a normal body shape, 2cm more can be placed from Gv to gv compared to the front of waist from Hü-tv, since for the normal figure an additional 2cm of width is needed. For more curvaceous figures an extra 2.5-3cm can be reckoned with, and by less curvaceous figures you can virtually use the same measure as Hü-tv place directly at Gv-gv. Next measure from gv-gh, the half width of seat + 2-3cm ease. The missing measure from G-gh must also be placed at g going both to the left and to the right in equal measure. In this basic pattern, 1.5cm has been taken out from the waist at t. The point of strongest waist suppression lies around 1cm above the waist construction line. The draft is nett. Seams and inlays have yet to be allowed for. One of the strongest aspects of the Rundschau system is that it gives the operator control over the amount of ease added at different points. These can be changed according to taste and fashion. Note that the word "bis" means "to" eg "1 bis 2" means "1 to 2". Finally a table showing the amounts of addition ease required when working with furs. The amounts of ease are added in addition to the ease already added as per the previous table. 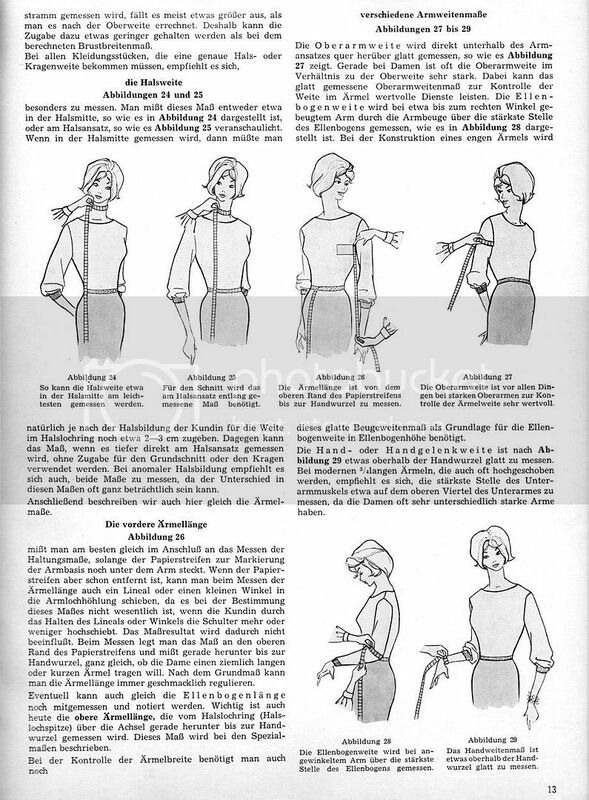 This concludes the basic introduction to the Rundschau ladies cutting system. 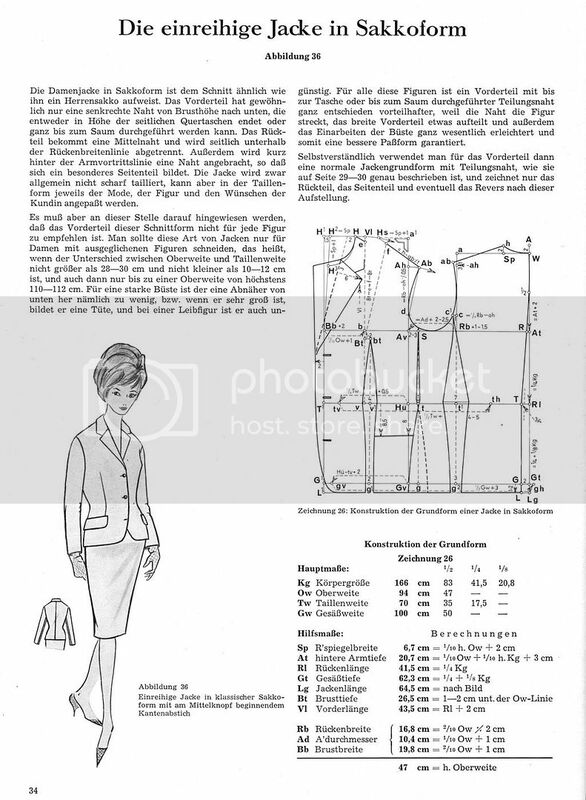 The draft that will be presented as an example of the Rundschau ladies' coat cutting system is the following one in a basic SB lounge style. I have chosen this because it seems to be very popular today. 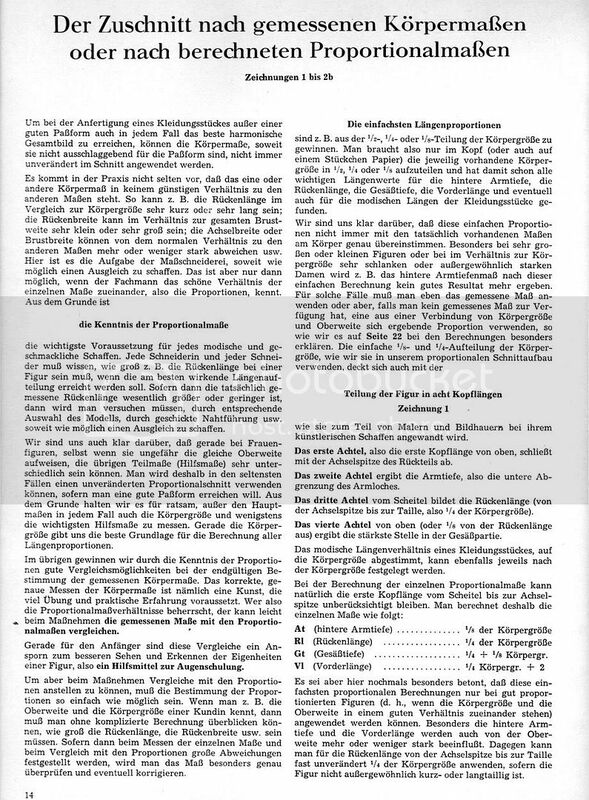 Once you have been taken through this, you should be able to look at most Rundschau ladies' draft up till the present day even if you don't read German.